A lively and practical guide to sell anything and up your business game from one of the top realtors in the world and costar of Bravo's Million Dollar Listing New York and Sell It Like Serhant. This book is the blueprint for how to go from sales scrub to sales machine. Serhant provides useful lessons, lively stories, and examples that illustrate how anyone can employ his principles to increase profits and achieve success. Your measure of a good day will no longer depend on one deal or one client. A good salesperson never closes a deal and wonders, "What now?" The next deal is already happening. Serhant shares practical guidance on how to juggle multiple deals at once and close all of them EVERY. SINGLE. TIME. 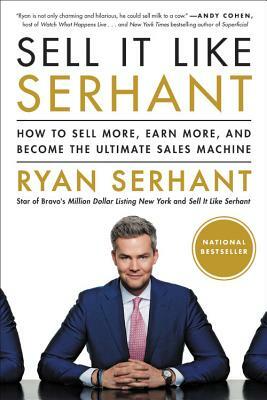 Ryan Serhant is a costar on Bravo's hit show Million Dollar Listing New York and the star of Sell It Like Serhant. Ryan fell into real estate by accident after giving up his acting career. He made just over $9,000 his first year in the business. Ten years later, Ryan leads a team of 60 brokers and averages a billion dollars in sales every year, making him one of the most successful real estate brokers in the world. He lives in New York City with his wife, Emilia. learn to sell like Serhant." "Sell It Like Serhant is the only sales book you'll ever need. "This book isn't just about sales, it's about self-improvement overall.